Prescription drug misuse is an issue that college campuses face everyday. According to the 2015 College Prescription Drug Survey , 1 in 4 undergraduate students have misused a prescription medication at some point in their lifetime. Although often perceived as benign, the misuse of prescription medications can have social, academic, and financial consequences, as well as increase the risk for developing a substance use disorder. The Higher Education Center for Alcohol and Drug Misuse Prevention and Recovery (HECAOD) understands the need for addressing this issue and the resource constraints, in both time and money, that campuses face. To combat this, HECAOD developed ScreenU, a web-based screening, brief intervention, and referral to treatment (SBIRT) tool to identify students at-risk of experiencing negative consequences for prescription drug misuse and connect them with resources on their campus that can support their success. SBIRT is an evidence-based practice supported by the Substance Abuse and Mental Health Administration (SAMHA) and the World Health Organization (WHO) and ScreenU was designed using these principles. Students begin by answering questions from a brief screening tool specifically designed with college students in mind. These questions will identify a person’s behaviors that would be considered prescription drug misuse and their level of risk of developing dependence to prescription drugs. Through unbiased motivational interviewing techniques, participants have an opportunity to reflect on the potential impact of their misuse and consider if they are ready to change their behavior. Participants then receive strategies that can help support the safe use of medications. Students who screen at a high risk for dependence receive a recommendation to treatment services. ScreenU closely mirrors this process, identifying a student’s risk level for experiencing negative consequences from prescription drug misuse and connecting them not just with strategies, but also resources local to their campus and community. Historically SBIRT has taken place in clinical settings, such as emergency rooms, trauma centers, and student health centers on college campuses with professionals trained in motivational interviewing. This causes a significant barrier to campuses working to implement SBIRT. However, ScreenU takes these steps and digitizes them, allowing students to complete the screening and intervention on their laptops, tablets, and smart phones. Additionally, ScreenU doesn’t require special training for staff, allowing for campuses to reach students in a variety of settings, including, but not limited to, academic advisors, conduct officers, Greek life, athletics, and first year orientation. ScreenU is brief, taking only 5-10 minutes to complete, making it conducive to being repeated multiple times while a student is on campus. 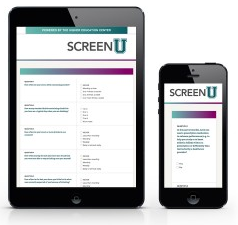 Currently 26 campuses across the country are implementing ScreenU with their students and HECAOD is excited about making ScreenU Rx, along with ScreenU Alcohol and ScreenU Marijuana, available to all institutions of higher education. Colleges and universities have a unique opportunity to reach young adults, at the average age of first misuse of prescription medications, and identify students at risk of developing a substance use disorder and intervene before dependence occurs. ScreenU can make this simple for campuses, providing a pro-active approach that supports a healthier campus life. 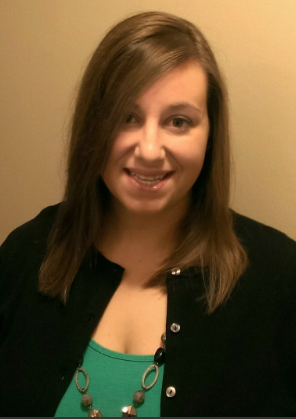 Cindy is a Prevention Specialist for the Higher Education Center for Alcohol and Drug Misuse Prevention and Recovery. She has spent 10 years working in alcohol and other drug prevention.